The Canadian government has announced the opening of the sealing season. Off-season fishermen will begin to kill seal pups on April 10th. The sealing will take place throughout the Gulf of St. Lawrence and the Atlantic ocean off Newfoundland and Labrador. Touching bond: Lying on the sand, the seal gazes down at her fluffy baby as it playfully wriggles around underneath her flipper and tries to resist just as human children do when playing with their parents. More seals will likely be killed this year than last year since Carino Processing is once again buying seal pelts. This Norwegian company, with a plant in Newfoundland, has announced that it will buy the pelts of 50,000 baby seals. 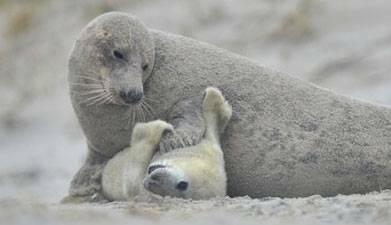 This is in addition to 8,000 to 10,000 seal pups who will be killed as a result of the purchases by the new seal skin processor, Fleur de Lys. Sealers’ association president says industry outlook more positive in 2016. The company behind one of only two seal processing plants in the province has decided to buy pelts from sealers this year, following a hold on the purchases in 2015. While the industry is still dealing with reduced markets internationally, 2016 is being viewed in a more positive light by harvesters now that Carino Processing has decided to seek 50,000 harp seals for meat, fat and hides. “We will use these products to continue to service existing customers and new opportunities,” company CEO Dion Dakins said in a statement provided Wednesday. The hunt is expected to open April 10 and, Dakins stated, harvesters have been made aware Carino is looking for stock. Canadian Sealers Association president Eldred Woodford did not go out to harvest seals last year — the first time in 20 years — given a lack of demand. However, he is considering it this year, he said. “It looks like it’s going to be substantially better than last year,” Woodford said Tuesday, citing Carino’s plans. It is also his understanding that the newer PhocaLux International operation in Fleur de Lys could take anywhere from 8,000 to 10,000 seals, he added. He couldn’t speak to pricing. “They’re still carrying an inventory of seal pelts, but in order to get meat or oil you’ve got to get new pelts in, too,” he said. Beyond pelts, he said he believes there has been, in recent years, a greater demand domestically for seal meat. Dakins has promoted the #HuntForFood on social media. Sheryl Fink with the International Fund for Animal Welfare (IFAW) said more needs to be said about how much of the animals are actually being used for meat, domestically or otherwise. “They’ve been trying for a long time to market the meats internationally. It hasn’t been successful,” Fink said. While the IFAW and others oppose the hunt, the provincial Department of Fisheries said leading into the current sealing season, Minister Steve Crocker has met with local stakeholders in the industry to assure them of the government’s continued support.